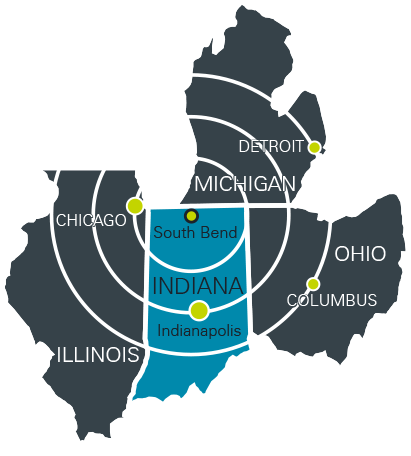 St. Joseph County, Indiana, branded the South Bend Region, is located in North Central Indiana, with a population of 269,141 people. The city of South Bend, population 101,735, is the economic and cultural hub of a multi-county, bi-state greater region, population 937,203 (eight counties), with a labor force of 471,522. South Bend also ranks as the fourth largest city in the state and is home to the iconic University of Notre Dame. Neighboring Mishawaka is the second largest retail center in the state of Indiana, and the entire region boasts modest housing costs, more than a dozen institutions of higher learning, easy transportation access and convenient commute times that average 20 minutes. Target industries include IT/data, logistics/warehousing and advanced manufacturing. South Bend-Mishawaka ranks 154th out of the 392 metropolitan statistical areas (MSAs) and includes St. Joseph County in Indiana and Cass County in Michigan. MSA population: 319,226. South Bend Community School Corp.
New Prairie United School Corp.
Resurrection Lutheran Academy, South Bend, Ind. The Stanley Clark School, South Bend, Ind. Trinity School at Greenlawn, South Bend, Ind. St. Joseph County Indiana U.S.
Atlantic Aviation offers aircraft fueling, servicing, storage and charter services from their SBN location. The following is also available at this location: Internet café, interactive pilots lounge, state of the art conference room, full de-ice capabilities, large group charter and large aircraft ramp/hangar storage.